Chicken soup has long been recognized as having therapeutic properties especially when one has colds and flu. No wonder every time we’re not feeling good, we resort to a bowl of chicken soup. Making the soup from scratch is healthier compared to just reheating from the can because freshly made soup has all the good stuff from the fresh ingredients with no added preservatives. Sotanghon is the Filipino term for transparent noodles, also called “cellophane noodles”, “glass noodles”, “Chinese vermicelli”, and “bean thread noodles”. They are usually made from mung bean starch. They are clear and see-through after cooking. 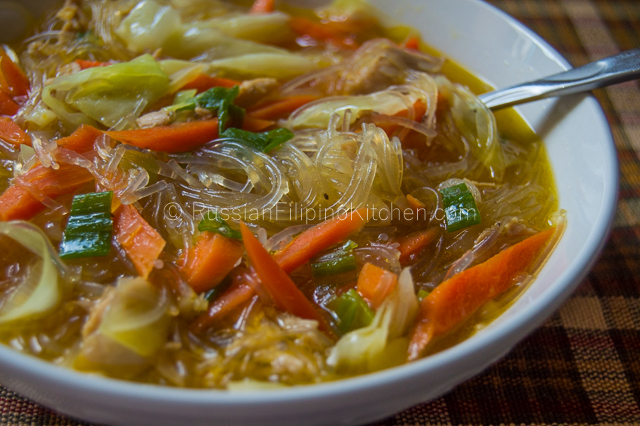 This Filipino version of chicken soup uses small pieces of chicken meat, broth, vegetables, sotanghon noodles, and some spices. I often make my own chicken broth by boiling two chicken legs, and shredding the meat for a quick sauté with the rest of the veggies. You can use leftover chicken meat, of course, and canned broth if you have them. 1. Wash chicken legs and place in a big pot with 7 cups of water. Smash the ginger or slice it thinly and add into the pot. Add 1 teaspoon salt and ¼ teaspoon black pepper. Bring to a boil, then lower heat and simmer for 20 minutes. 2. While waiting for chicken to get ready, soak noodles in cold water to soften it before cooking. Do not use hot water or they’ll turn very soft and soggy. 3. When chicken is ready, remove chicken legs from pot. Remove most of the flesh from the bones and shred into small pieces. Set aside. Strain the broth and also set aside. 4. In a large pot, heat oil and sauté garlic and onions until garlic has browned a little and onions are translucent, about 2 minutes. 5. Add chicken meat and sauté for 3-4 minutes. 6. Throw in the carrots and sauté until softened a little, about 2 minutes. 7. Add soy sauce and mix. 8. Pour in the chicken broth and the remaining salt and pepper. If using canned broth, skip the salt and pepper, or adjust according to taste. Bring to a boil. 9. Add pre-soaked sotanghon/vermicelli noodles and cook for 5 minutes. 10. Add green onions and cook for another minute. 11. Add shredded cabbage last and cook for another minute or until slightly wilted. 12. Ladle into a bowl and enjoy this hearty soup!